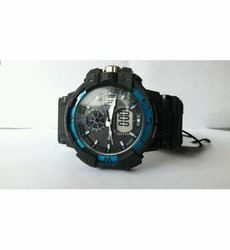 Xergy presents analogue-digital quartz wrist watch for men. It has round dial shape and black & orange dial color. Men's Japanees Quartz Sports Watch, Analog display, alloy case, Black Dial, 1.2 cm approx. thickness, with fabric band length approx.26 cms and width approx 2.4 cm. Case diameter is approx. 5.3 cm. The small sub-dials on the watch face are for decoration only. 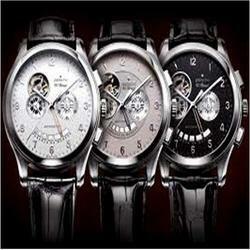 The company was founded in 1881 by a clockmaker in Tokyos Ginza District. Applauded for its accuracy and craftsmanship, the Seiko watch became a resounding success and by 1938, demand for the timepieces pushed yearly production to well over one million watches. Yet another classic Analogue Mens timepiece which has been designed by Timex Intelligent Quartz. This piece incorporates a Black Rubber Bracelet and a Stainless Steel case which compliments the Black dial. The T49859 Timex Intelligent Quartz Mens wristwatch comes with a 2 Years Manufacturer warranty.